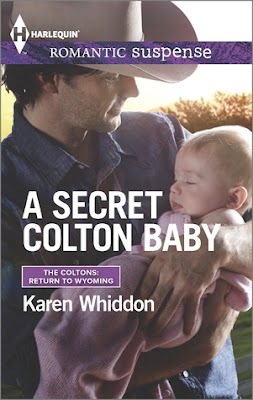 A Secret Colton Baby by Karen Whiddon has a mysterious baby, a bewildered hero who has just found out that he is a father, a heroine with a scary past that has her running to a new town and a stalker come alive from her past. As if this is not enough, soon there is also a deadly virus loose on the town with everything under quarantine. With so much mystery and suspense promised, I dived into this book and I am so glad that I did! My first book from Karen, I thoroughly enjoyed her story development and skill with which she maintained and enhanced both the romance and the suspense. Theo Colton's backstory of how he had to forego his rodeo career after an injury and Ellie's past that had her fleeing to a new town and living as a hired cook were interesting and intriguing. The chemistry between these two characters is both sensuous as well as heartfelt. I enjoyed meeting the other Coltons and hope to read their story too. The story is fast paced and had me engrossed throughout. Karen's writing style is engaging and she managed to create a thrilling, suspenseful and curiosity stirring atmosphere where I spent each second curious to know what happened next, all the while hoping for a happy ending. The baby is so cute and I wanted to cuddle him and loved each and every scene with him in it. All in all, A Secret Colton Baby by Karen Whiddon is a total entertainer with a good plot, well developed characters and good writing. 4 out of 5 to it and recommended to all lovers of romantic suspense. I will be checking out the other books in this series in the future.